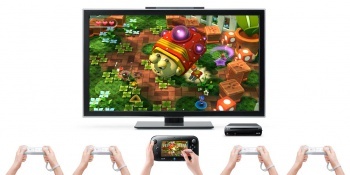 Wii U games will get a price increase from last generation. Though Nintendo announced two different price points for the Wii U console earlier today, it failed to mention how much the games would cost. The publisher has now confirmed that Wii U software will be priced at $59.99, which is a ten dollar increase over last generation's Wii games. This doesn't come as a huge surprise; Xbox 360 and PlayStation 3 games have been $59.99 since the respective consoles launched, while Wii games remained at $49.99. Still, with the holiday gaming season already looking pretty expensive, it would have been nice to see Wii U games stay at fifty bucks so we could save a few pennies. It will be a while before we know whether or not Sony and Microsoft are also going to increase pricing for their next-gen games, but let's hope this isn't the start of a trend. And of course, this only applies to the high-end Wii U titles; there will likely still be plenty of games priced under $60. Nintendo's first confirmed launch games, New Super Mario Bros. U and Nintendo Land, both have $59.99 suggested retail prices, making the premium Wii U bundle (which includes Nintendo Land) look like an even better value.